On my most recent trip to Japan, I had the chance to go aboard two museum ships in Yokohama harbor. One was the former Japanese naval sail training ship, the Nippon Maru, a four-masted barque with auxiliary diesel engines. The other was the NYK Hikawa Maru, a former luxury passenger liner built for North Pacific routes between Japan and Seattle/Vancouver. Both ships were built in Kobe and made their maiden voyages in 1930. 飾り毛布 kazari-moufu 'decoration-blanket' — Last year, when we toured the Hakkoda train ferry museum in Aomori, we noticed some ornamentally folded blankets in some of the ship's cabins. According to Japanese Wikipedia, the practice of folding blankets into decorative shapes—like origami in wool—originated in 1908 on the ships ferrying passengers across the Seikan Strait between Aomori on Honshu and Hakodate on Hokkaido. (There is no other Wikipedia article in any language on the decorative folding of blankets.) This year I noticed and photographed the same phenomenon in officers' berths aboard the Nippon Maru and in first-class passengers' berths aboard the Hikawa Maru. The Japanese Wikipedia article also links to the FAQ page of an OSK passenger liner named Nippon Maru, whose last entry addresses the question of kazari-moufu. The English version of an explanatory sign outside a passenger cabin on the Hikawa Maru follows. Ornamentally folded blankets, called "decorative blankets (Kazari-mofu)", were common during the age of passenger ships. The blankets were folded by stewards and placed with care on passengers' beds. The designs included flowers (Hana-mofu), a sunrise, and even the helmet of a samurai warrior, generating anticipation among many passengers about the day's creation. The designs of flowers were originally called "floral blankets (Hana-mofu)" but as stewards became more creative with their designs, the name changed to "decorative blankets (Kazari-mofu)" to better reflect their creations. 喫水線 kissuisen 'waterline' — On the lowest deck of the engine room, there was a red line just over head-high on the inside of the ship's hull that marked the normal waterline, labeled in katakana uotaarain (< 'waterline') and in kanji as 喫水線 kissuisen, which translates literally as 'eat/drink-water-line'. The first kanji shows up in compounds such as 喫茶店 kissaten 'drink-tea-shop (= teahouse, coffee shop)' and 喫煙室 kitsuenshitsu 'drink-smoke-room (smoking room)'. But 喫水 kissui also means the 'draft (of a ship)', so 'eat/drink-water' is probably better glossed here as 'displace-water'. You never know where you'll learn a new English usage while traveling abroad. I came across a couple usages while on vacation in Japan this month. An English usage new to me appeared on a trash and recycling receptacle in Cafe Cuore atop Miraishin no Oka, a hill of white Italian marble imported and sculpted by Kazuto Kuetani on the grounds of the Kosanji Temple Museum. 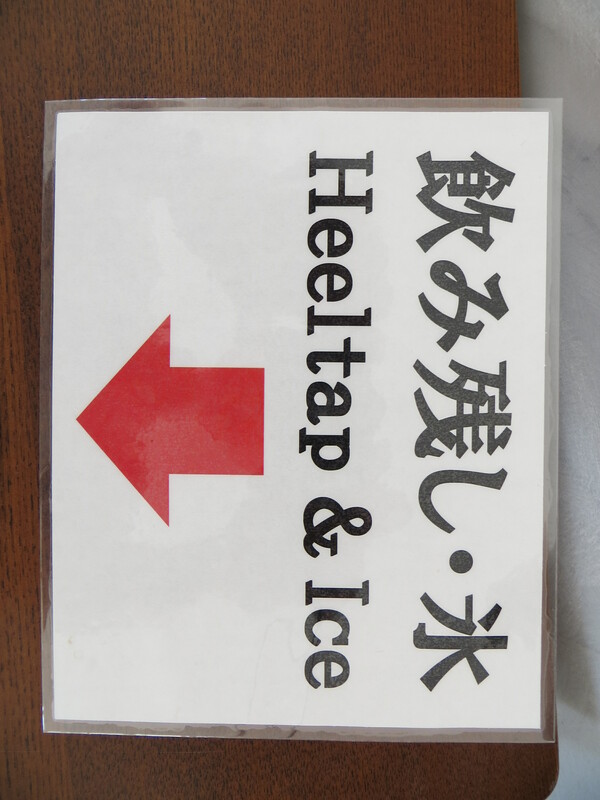 The Japanese sign reads nomi-nokoshi 'drink-leftovers' and koori 'ice', so the meaning was clear enough, but I had not encountered that use of heeltap before. The Kenkyusha Reader's Plus dictionary in my little Canon Wordtank, however, listed heeltap with two definitions 'heeled shoes' and 'drink-leftovers'. Another phrase new to me appeared in a first-class cabin hallway aboard the NYK Hikawa Maru, a Japanese luxury passenger and cargo ship launched in 1930 to run between Japan and Seattle. It was nicknamed the Queen of the North Pacific, and carried Charlie Chaplin among other famous passengers. It was built to compete with the best at the time, and managed to survive the Pacific War because it was requisitioned to become a hospital ship and because its hull was engineered to withstand heavy northern seas and to stay afloat even after hitting a couple of underwater mines during the war. From reading about British India, I was familiar with the punkah ceiling fan and the poor punkawallah whose duty was to pull the ropes to keep it in motion while his masters attended to other matters. 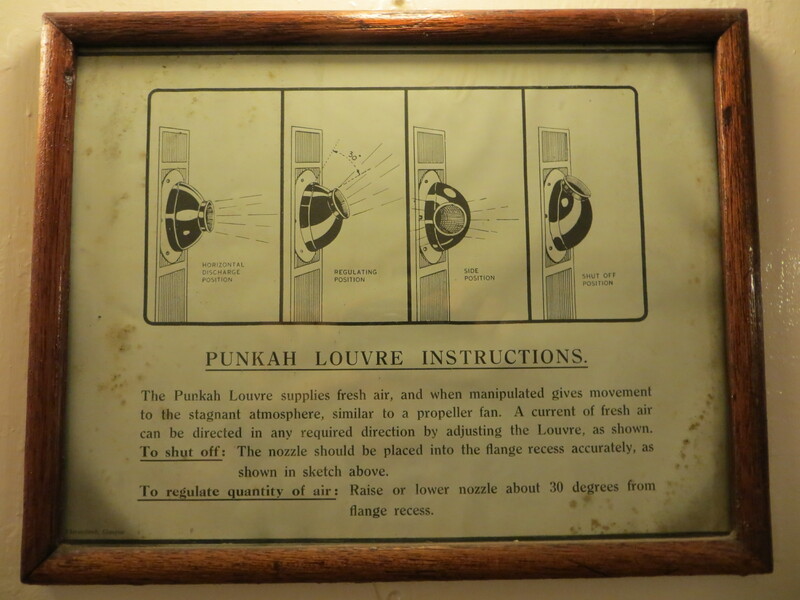 Wikipedia notes that punkah louvre is used to refer to the air vents in passenger aircraft, but this usage for similar individually controlled air vents in passenger ships looks to be older. "One thing it ain't, is black and white"
At first glance, Delores's lineage is difficult to discern. Before now we have spoken only on the phone, after I was given her number by her niece, Laura "Butch" Ross. During my research into the story of Prospect Hill, I have often conducted first interviews on the phone rather than in person, and sometimes have found myself deliberating whether the person I am speaking with is descended from slave or slave owner, because many have similar accents and frames of reference. I wait for their perspective to reveal itself through some telltale sign—a verbal marker such as the use of "aks" in place of "ask" by blacks, or a reference to "faithful slaves" by whites. Sometimes the clue lies in what is left out of their account. The prevailing white version of the story of Prospect Hill always includes the slave uprising, but the prevailing black version never does. In many cases my assumptions have turned out to be entirely wrong, and I might be deep into a conversation before I know for sure. In Delores's case, neither her speech nor her perspective gave her away on the phone. Finally she said, "I'll just be frank with you, it was kind hard growing up in the South with a black mother and a white father." After greeting me at the door and inviting me in, Delores launches into one of the more curious genealogies that I have come across. "I'll tell you, Roots, the best movie ever made, don't have nothin' on the Ross family," she says. "We're all over the place. Go way back, all over the place. Here some of 'em started out in Africa, come to Mississippi, then end up back in Africa. And a whole lot of 'em—black, white, you name it, been right here all along—and I'm talkin' a long, long time. Delores's hair is long, wavy, and black, carefully molded with pomade, her skin midway between black and white. Her house is a catchall sort of place, with furniture from the 1960s and 1970s, potted plants and vases of plastic flowers, and every available surface crowded with memorabilia and framed photos of people, both black and white. Many area residents have a tendency to reduce key figures in local history to archetypes and stereotypes—good guys and bad guys, everything black and white, but not Delores. She listens patiently to a summary of the history of Prospect Hill, then leans back on her sofa and takes a long drag off her cigarette. She is unpretentious and self-possessed, and has no qualms about entertaining my questions about her family history—in fact, she relishes the opportunity. "Here, pass me that picture there, Butch," Delores says, and Butch hands her a framed photograph from among the group clustered on the coffee table. "That's Thad Ross, my daddy," Delores says, and passes the photo to me. "He was a descendant of Isaac Ross." The photo looks to have been taken in the 1930s. A white man is seated on a sofa beside a dark-skinned girl with a black woman seated in a chair nearby. There is no mistaking they are a family. "It was taken down in Jefferson County," she says. "That's my father there. The girl is Jimmie, my sister, Butch's mother. The lady's Queen Esther Polk, Jimmie's mother." Delores points to a group of framed photos on the mantel, and adds, "That's all my family up there." She goes down the line, naming names. Most of the faces are black, but some are white, and others are in between. She pulls out her albums and shows me snapshots of blacks and whites intermingling unself-consciously—fishing on a lake, visiting in someone's living room, gathering for a graduation...."
"Isaac Ross was a unique fella during that time," James [Belton] says, in typical understatement. "He went along with slavery but his slaves were not slaves in the traditional sense. I doubt seriously if you would find anything written about the slaves before 1870, when blacks were first included in the census. But from word-of-mouth, folklore, what was passed down from generation to generation, it is apparent they were not like other slaves. I was told, you know, that some of those Beltons actually attended Oakland College. They were not free, per se, but they were educated." Before the Civil War, Oakland College was a private school for planters' sons, and Isaac Ross sat on its board. Today it is Alcorn State University, which was founded in 1871 as the first land-grant college for blacks in the United States. Most historical accounts note that many Prospect Hill slaves were taught to read and write, and that they all enjoyed relative freedom within the confines of the plantation. Ross never sold any slaves, and it appears he kept them sequestered from the slaves on neighboring plantations. When Isaac Ross Wade took over as master of the plantation, however, they were treated like any other group of slaves, James says. "By the time of the burning of the house, from what I gather, all of the slaves but a few were extremely bitter. Isaac Ross had treated them like relatives, and the truth is, a lot of them were relatives. The Belton ladies who worked around Prospect Hill were very light—you couldn't hardly tell 'em from white ladies, my father said. But after Isaac Wade contested the will [that freed the slaves and offered them emigration to Liberia], they weren't getting the treatment they had gotten during Ross's lifetime, and resentment just built up. That was how they came to set fire to the house." Why did any of the slaves choose to remain behind when the majority emigrated to Liberia? James has a ready answer. A few were not given the option of being repatriated, he says, "most likely because they were just bad apples, like you have in any community." The others, he says, may have been wary of traveling to a distant, unknown land. But Mariah was different. Belton believes she chose to remain behind because her two sons, Wade and Edmond, had fled Prospect Hill to escape being lynched in the aftermath of the uprising, and perhaps she knew their whereabouts. "There's a lot about our history people don't realize," he says, "Like that a lot of blacks in the South owned slaves." In his view, the story is complicated, and it is shared. "Some of the white Rosses have helped me put a lot of information together, and the white Beltons, too," he adds. When I mention what so many have said about the story not being simply black and white, he smiles. He says there are a lot of gradations between any two extremes, and cites as an example the quasi-ward system that he remembers as a child, which was similar to that which exists in Liberia today. "It was basically the same way here," he says. "It wasn't like slavery, but I grew up with a stepbrother and -sister, who Dad took in and raised 'em, and they worked for the family. They were like family, and they were less fortunate, and they worked for us. I see a lot of that—people who are less fortunate, maybe because they're darker-skinned, and they weren't given the same opportunity." Labels: Africa, language, Liberia, migration, slavery, U.S. In creating its Liberian colony in 1820, the American Colonization Society used as a template the colony of Sierra Leone, immediately to the west on the coast of West Africa. Freetown, the capital of Sierra Leone, had been founded thirty years earlier by English philanthropists as a home for freed British slaves, many of whom had originated in America but had won their freedom by fighting for the crown during the American Revolution. West Africa was chosen for the colonies for several reasons, but primarily because it was known as the "slave coast" and was the general area of origin of large numbers of slaves, including the majority of those who ended up in the Americas. Historians estimate that approximately sixty million Africans were captured as slaves in West Africa from the first recorded slave sale in 1503 to the end of the trade in the mid-nineteenth century. Of those, an estimated forty million died before arriving at their destination. By the end of 1822 a tenuous peace was negotiated between the settlers and the tribes. Soon after, colonization society officials rebuked the immigrants for what they considered to be a poor effort at self-sufficiency. Clifford wrote that the settlers considered farming too closely akin to the slavery they had known in the United States, yet they had few other economic options aside from trade, which was dominated by the tribes. To engender a sense of purpose, and because the colonization society was having difficulty finding leaders who would remain in place, the group named the colony Liberia and sought to regiment its government on the local level. The colonists began bartering for more coastal land and eventually took control of most of the valuable slave trading ports. By 1830 more than 2,500 immigrants had arrived in Liberia from the United States, and the next year the state of Maryland incorporated its colonization society, distinct from the American Colonization Society, and appropriated money for its own colony. Even as the colonization effort was getting on its feet, opposition in the United States grew. The concept of colonization was challenged by both white abolitionists and free blacks who argued that African-Americans had earned a stake in the United States, and that repatriation was tantamount to deportation. Those concerns would still be echoed in 1851, when Frederick Douglass, in a speech to the Convention of Colored Citizens, attacked colonization, saying, "But we claim no affinity with Africa. This is our home ... The land of our forefathers." African-Americans, he said, "do not trace our ancestry to Africa alone. We trace it to Englishmen, Irishmen, Scotchmen, to Frenchmen, to the German, to the Asiatic as well as to Africa. The best blood of Virginia courses through our veins." Labels: Africa, Britain, Liberia, migration, Sierra Leone, slavery, U.S. It's strange to hear a Christian hymn in a Japanese Buddhist temple, being led by the minister, no less. But [Rev. Earl] Ikeda [of Mō‘ili‘ili Hongwanji Mission temple near the University of Hawai‘i at Mānoa] had a reason. "I was invited to do a funeral service recently," he explains. "I talked with the family and mentioned that it didn't have to be a strict service done in the Buddhist tradition." He explained to the family that they could choose a gatha, or song they felt would best honor their loved one. They chose "Amazing Grace." In fact, adds Ikeda, when it came time to sing, the Buddhist minister himself led the mourners in the Christian hymn. The person most credited with establishing Buddhism in the Islands is Bishop Emyō Imamura. He came from Japan in 1899 to examine life at the plantations, and he was instrumental in building temples in plantation towns. Plantation workers converted plantation homes to create the first temples. By the mid-1920s, there were more than 170 temples in Hawai‘i. They were the lifeblood of the plantation towns, where they served not only as the place of worship, but as a commmunity center and as the nucleus for political and labor discussions as the Japanese fought for a place in the Islands. In addition to a shrinking membership, Hawai‘i's Japanese Buddhist temples are also facing a shortage of ministers. Take [Rev. Jay] Okamoto. For the past six years, he's not only been the minister of the Waipahu Hongwanji, but also the temples in ‘Ewa and Wai‘anae, neither of which have had their own resident ministers in 30 years. The ‘Ewa temple has 30 members and the Wai‘anae temple has around 50, he says. All Japanese Buddhist ministers must be ordained in Japan before they can work in Hawai‘i and on the Mainland. This often makes it difficult to attract local men and women in the first place, because they have to speak Japanese for their studies. Often, Japanese ministers end up serving in Hawai‘i's temples, but, says Okamoto, they, too, face linguistic and cultural challenges. It's a catch-22. There's also a seasonally related article by David Thompson in the same issue headlined "Bondancersizing the Night Away" (pp. 43-45). UPDATE: The article is about "Bondancercise" classes, a word formed from the merger of Bon + dancer + exercise, but the spelling "Bondancersizing (the Night Away)" implies right-sizing Bon dancers (weight loss).